If the thermometer on my car is right, it is currently 96 degrees outside. I’d say summer is h-e-r-e!!! While living in the great Midwest doesn’t afford much of a true beach experience, we can always dream! This poppin’ pink tropical tablescape for 10 is great for a gathering of friends celebrating any casual summer occasion. I know my good friend/cake stylist, Patrick “the-Flamingo-Lover” Snuffer, would never leave! I used two 6-ft. oblong tables pushed together horizontally to create an “almost square.” This shape provides more decorating space in the center with room left over if necessary for bread baskets, wine carafes, condiments and such. The melamine dinner plate is a fun and inexpensive 2012 purchase from Old Time Pottery costing just $2.49 apiece. The napkins are actually bandanas purchased at Hobby Lobby. At just $.99 each, you don’t freak out so much about teriyaki sauce stains! 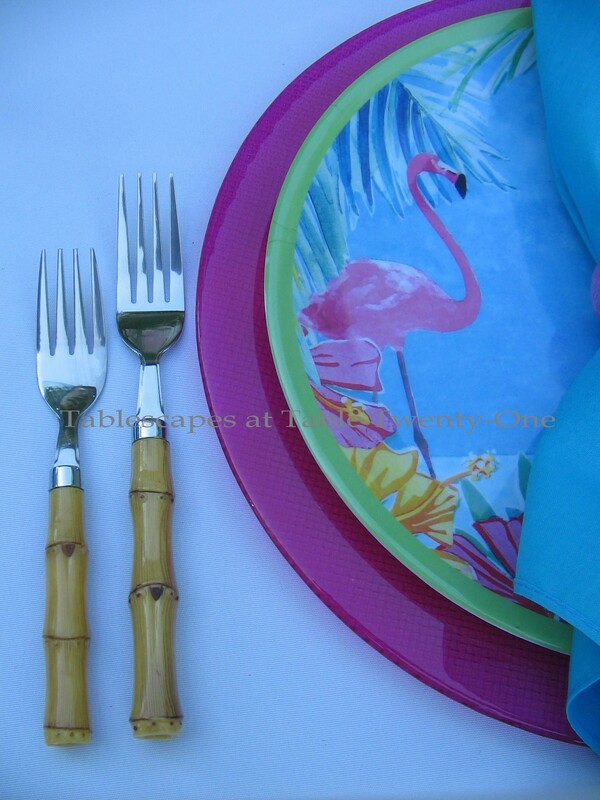 I used faux bamboo flatware from JC Penny Outlet to keep the tropical theme going. This gorgeous and substantially-weighted turquoise blue stemware from Pier 1 is a perfect match to the cool blues in the dinner plate. Clear glass cylinders are the workhorse of my centerpiece inventory. You can find them at places like Old Time Pottery, Michael’s, Hobby Lobby and Home Goods. Here a mix of high, medium and low cylinders displays some of the hundreds of seashells gathered or received as gifts over the years. Chalky white starfish from Z Gallerie sit atop the cylinders to add a little more height and form. Snippets of hot pink and cream-colored plumeria are tucked here and there among the shells along with clear cylindrical votives. Even more color and texture is introduced by way of deep green hostas and tropical-looking ferns pillaged from our yard. 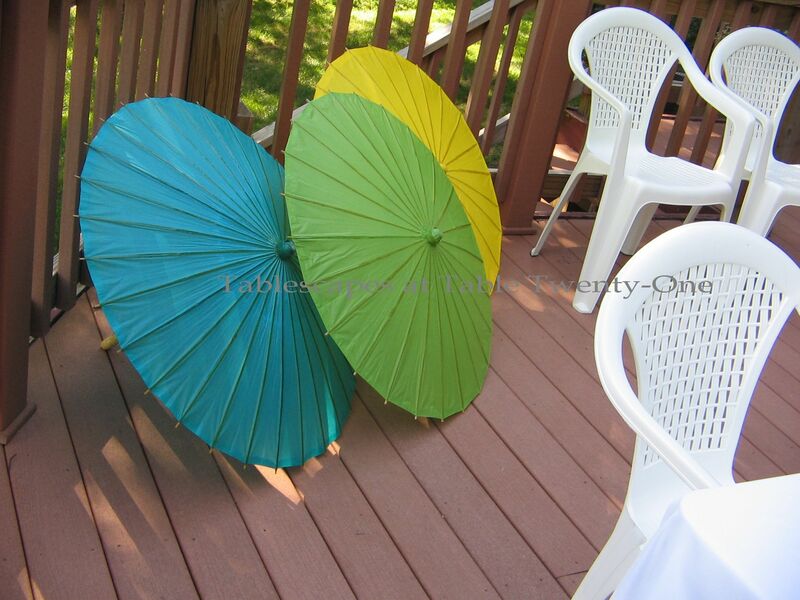 These brightly colored paper parasols from Hobby Lobby get a real workout at our house! I like to casually plunk them down around the perimeter of the deck to add color and a little bit of a “Wow!” factor. They’re cheaper and less back-breaking than bringing in a bunch of potted palms. Here they’re kind of like umbrellas in the sand at the beach! A small oblong drink and hors d’oeuvres table is set up at one end of the deck, flanked by still more of the pretty paper parasols. Another, resting atop another glass cylinder, shades the food & drink from the unforgiving glare of the early evening sun. Tiny parasols garnish each glass. 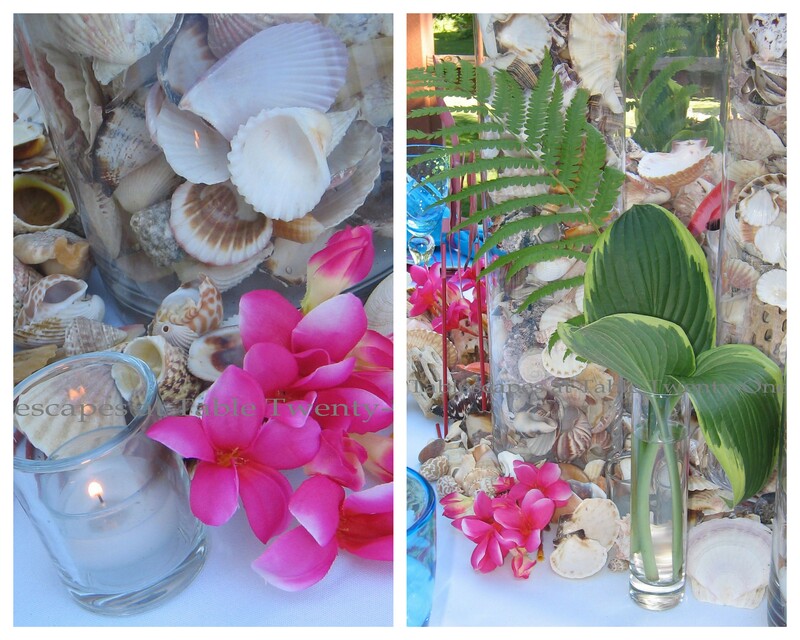 And this, dear friends, is what goes into the creation of a fun, colorful, casual beach/tropical-themed tablescape! I will join Cuisine Kathleen for her 14th “Let’s Dish!” this week. Be sure to tune in anytime after 6:00 p.m. CDT on Wednesday. This week is her “At the Beach” tablescape challenge, so it will be lots of fun! C’mon and go surfin’ safari with us! Looking for great centerpiece ideas? Join me at the Style Sisters’ blog for “Centerpiece Wednesday“. I’ll also join Susan at Between Naps on the Porch for “Tablescape Thursday“, available anytime after 9:00 a.m. CDT on Thursday. Come on over! And check me out on BeBetsy.com! It screams summer ! Now I’m craving a margarita ! Every time I think you can’t possibly top yourself you do! I am loving those pink flamingoes — it’s all just too perfect. I jumped the gun last week because I got a post in email from a very busy blogger, and I should have checked at Kathleen’s. She just laughed about it and told me to post another that she had liked from long ago. Guess I’ll see if I can find the photos. I am still mad I couldn’t get any of those glass chargers — they are fantastic! I think colors you have put together here just cannot be any better. Gorgeous Alycia. One of my favorites. Love the tropical punch and flamingos are as cute as they can be. I am ready to party….such a fantastic deal on those charger plates. The parasols add alot of pizazz to the party. 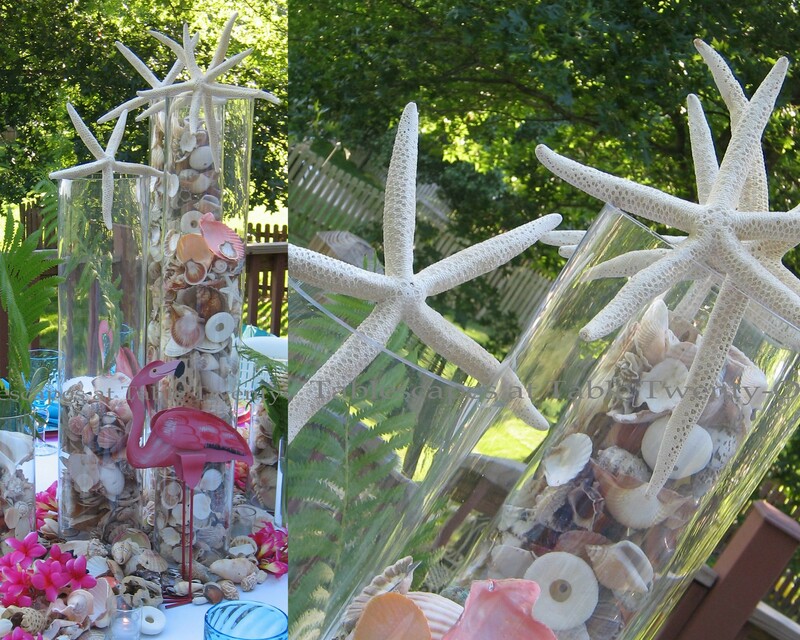 The centerpiece is outstanding with the shells and the starfish. Love this! I LOVE the colors and beachy feel of this tablescape. It makes me want to book a flight to Florida right now!! You are very inspiring and soooooooooo creative. Hi Alycia, I’m loving this tablescape. Cool colors for a hot summer day. Love the flamingos, great theme! I would love to sit down to dinner at your party, and yes I would love a margarita! Do you really think you can post a table like that and not have me on a plane to come drink tropical drinks with you? Don’t put stuff away…..I’ll be there in the morning. I love the color of this one so much. I’m all about hot pinks and blues in the summer. Actually I’m all about every hot color. My favorite little tidbit on the table is the flamingo salad/dessert plates. They’re adorable. And I’m with ya 100% on using those bandannas from HL as napkins. They work perfectly, especially for a summery outdoor meal. Hi Alycia! I love the flamingos! I have picked up several different flamingos this summer at sales but haven’t used them in a tablescape yet! Oh, and the golf balls were not harmed during the making of my Tee Time tablescape! LOL! 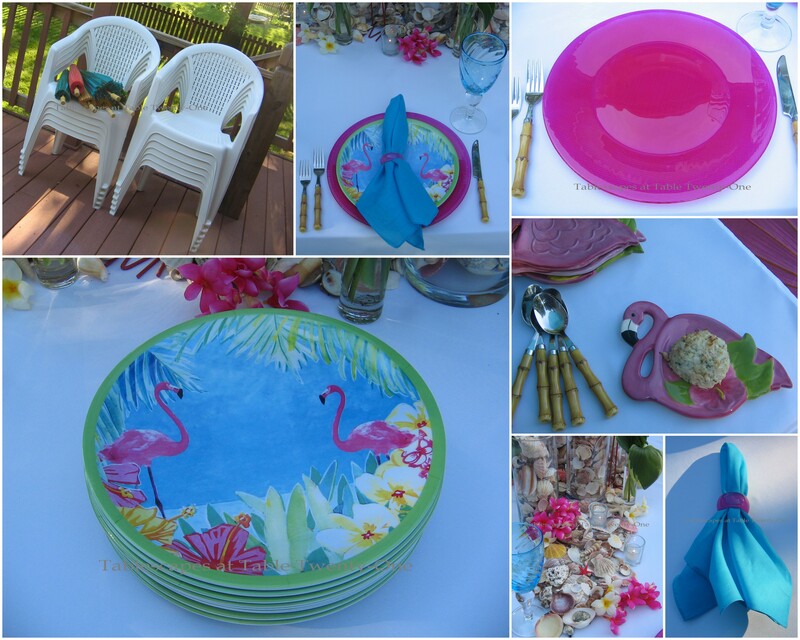 Alycia~ What Hot Fun in the Summertime at your Flamingo table! I love your cylinders~ what a wow factor they provide filled with shells and so versatile too! I love your suggestion of putting your tables together to create a square that provides more service area for food and drink and makes conversation easier too. 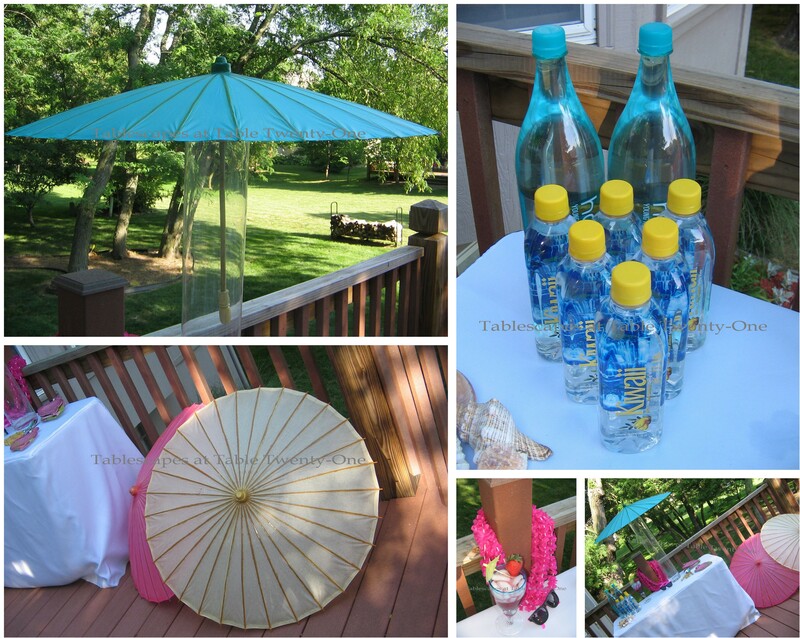 Your parasols provide the perfect pop of color~ so great too atop your cylinder! Your gorgeous table has a wonderful underwater feel Alycia. I noticed that at Kathleen’s with your thumbnail. Hello Alycia! Oh I do love the colors and the setting of your table on the deck. Very nice! So many fun accessories! Oh fun, fun, fun, Alycia!! I love the bright colors and your thriftiness with the melamine. The flamingoes just add the “wow” factor and the cylinder centerpieces are stunning. The parasols sure add a colorful party atmossphere. LOVE your flamingo table! The colors are “hot” and cool at the same time, and the spillage of shells looks very dramatic! The white tablecloth keeps it all very elegant! It was 100 degrees when I set up my tablescape, so I left it out overnight, and took photos the next morning and evening. Geez, what’s July and August going to be like? I love Flamingos so this table is calling my name! Love your cylinders, such a great way to add height and carry out a theme. The Flamingo dessert dishes are especially cute! Such cool colors for a hot day! 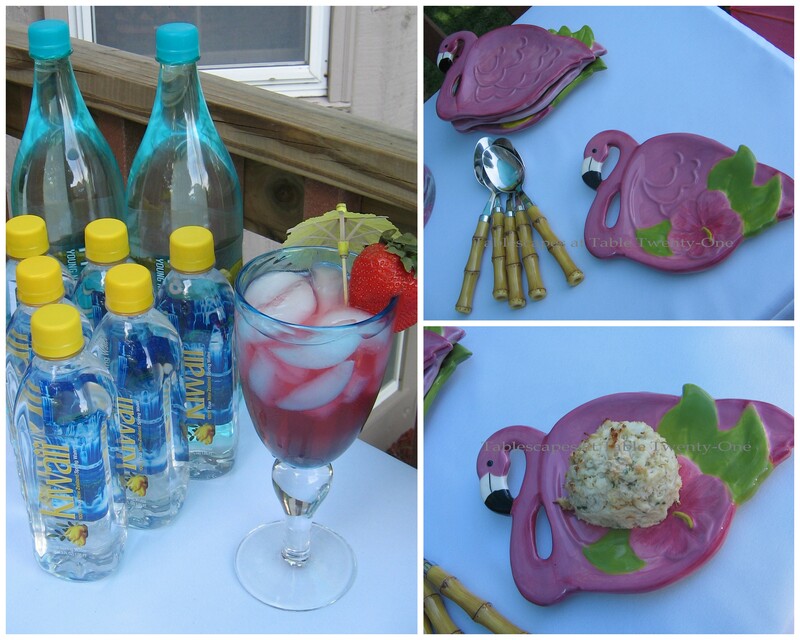 Love both sets of flamingo plates – so cute! 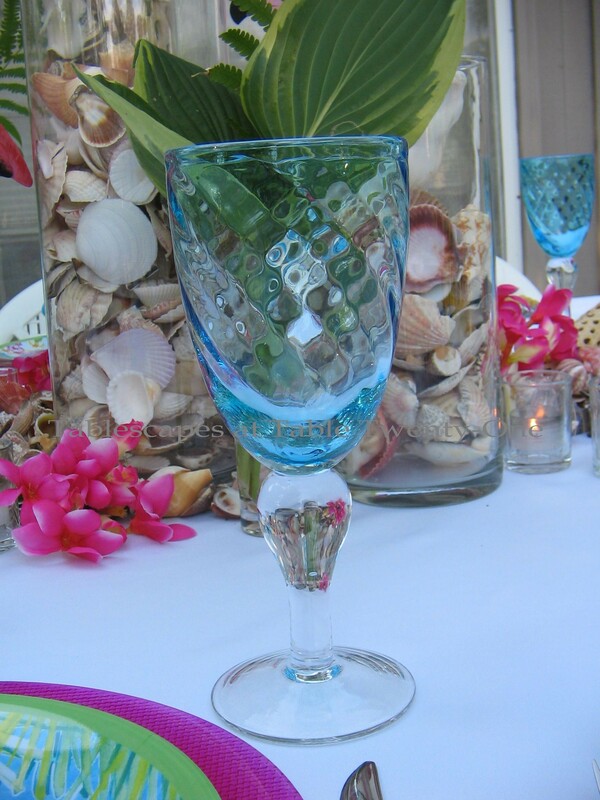 Love the aqua stemware. Your hosta leaves look absolutely tropical. I’ve GOT to get some of those glass cylinders… so versatile. It’s all so festive and pretty! Love it! I don’t know how you do it. You are a true designer artist. Your tablescape is so lovely. I love the orchids, shells and cute flamingo plates. The napkins are lush and drape so pretty in the napkin rings and the shade of blue in the napkins and glasses are beautiful. The texture of the bamboo flatware and the chargers… all the elements make it an A+ tablescape! woo-hoo girl!! What a great table. I love the colors and the flamingos look right at home, even in the midwest 🙂 As always you outdid yourself with color, creativity and elegance. stripes with the flamingos on them, a friend of mine had them and I was envious and then found a set in my birthday bag. Oh, the way, the other reason you couldn’t get rid of me is because your such a good friend and good company. Wonderful and colorful display. What a FUN table!!! Love the colors but especially the flamingo theme. Once again you have outdone yourself. I’ve been back from our Alaskan cruise almost 2 weeks now and still haven’t posted on my blog. I’m knee deep in a huge project that is taking precendence over everything right now accept my husbands cancer tests and treatments. Tomorrow we’ll know how he’s doing. I’ve missed so many posts from all my blog friends and have so much catching up to do. But you my dear just put a smile on my face and a warm summer breeze wafting through the air with your darling flamingo party. Even as hot as it is I’d have loved to have been there. I need that flatware and the ceramic flamingo plates. LOL. Great table as always! Good idea on the napkins. Alycia! No one does a centerpiece like you do. That is just over-the-top and I love, love it. Also, those flamingo plates will make me smile all day. What a post – you have pulled it off, once again!! What a fun tablescape! I love both of your flamingo plates! The centerpiece arrangement is perfect! Love how you used the sea shells and the starfish playfully laid on the tops are too cute! I’ve never used hosta leaves in arrangements before, but they look good! The umbrellas add the perfect touch! How do you do this??? You are so amazing…each week you present the perfect table then next week you do it again!! I LOVE the flamingos!!! As usual, all the wonderful details make this wonderful table even more fabulous!!! Love all the shells, flowers and especially the parasols!!! Your flamingos are so fun and colorful! I used this theme for my daughters high school graduation party (since she was going to college in FL) and we had so much fun picking things out. The parasols are really a nice touch and I love those bright chargers. Most of the country is hotter than we are here this week! That’s a switch! thanks for coming by it was great to hear from you hon. 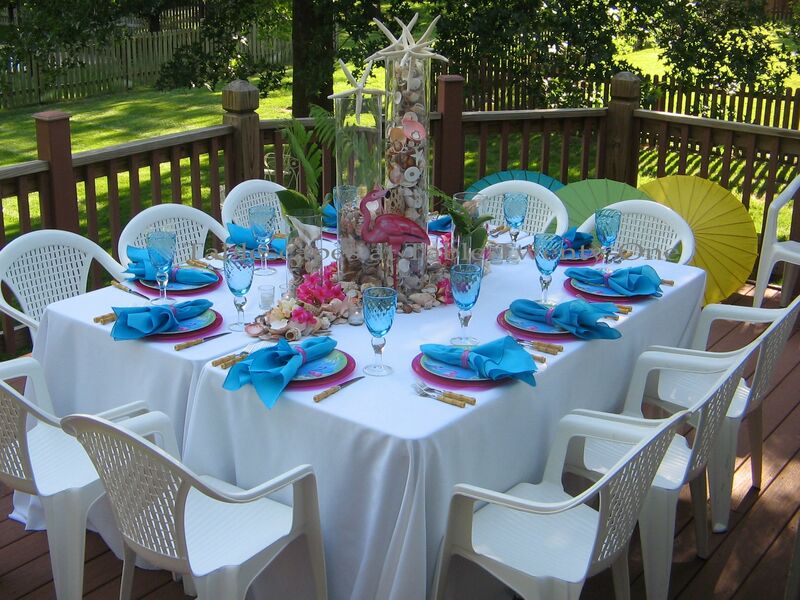 Really enjoyed your lively tablescape, love the colors together and what a cute and fun centerpc. 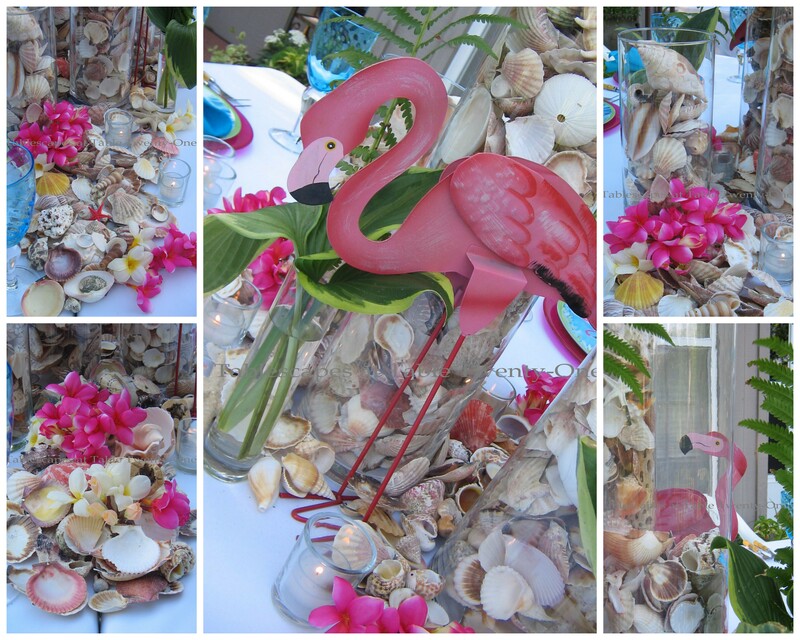 with that flamingo and loved the way you displayed the shells as well, nice setting outdoors too. Your tables are always so fun and festive. Absolutely beautiful and the parasols are perfect. Thank you for visiting and can I come for a swim? 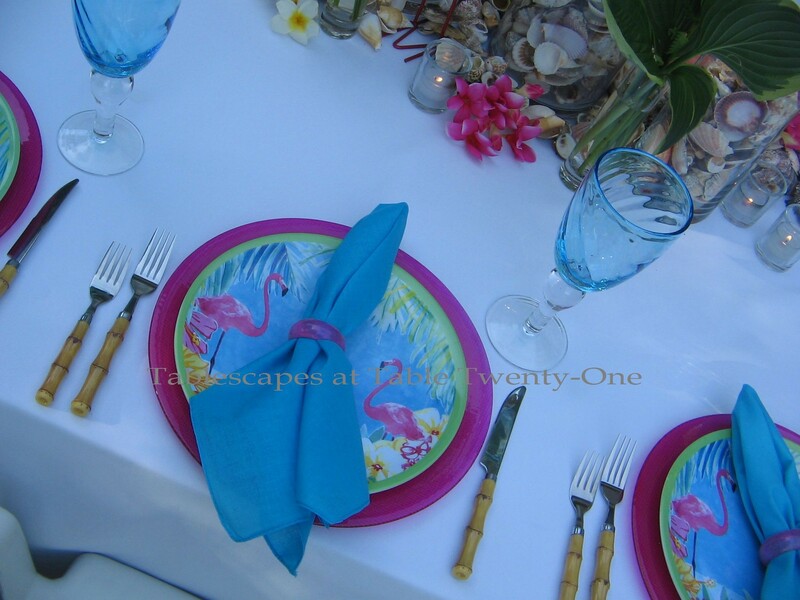 Oh Alycia, your Flamingos in Paradise tablescape is perfect. Glad to see those charges used in your table. The centerpiece is WOW, couldn’t get enough of it. Great idea with the three jars and shells and the cute flamingo. Love the umbrellas too, great for the theme. I would never had thought to use bandannas for napkins, small cookie you are. Another great one!! All we need is Jimmy Buffet! And that is another story I have to tell you someday! Love this fun table, the colors are fabulous! The chargers are wonderful, and I love those glasses, gorgeous! It was 95 here today by the Bay, sweaty for sure! Tomorrow we are back to normal. Thanks so much for linking this well thought out table to Let’s Dish! I am coming over. This is another stunning table. I can just hear the music thePier1 glasses are perfect. I love the color combo. I am going to have to surptiseeveryone with some pink flamingos. Your pink flamingo shaped plates are just fab. You have too much fun!!!! 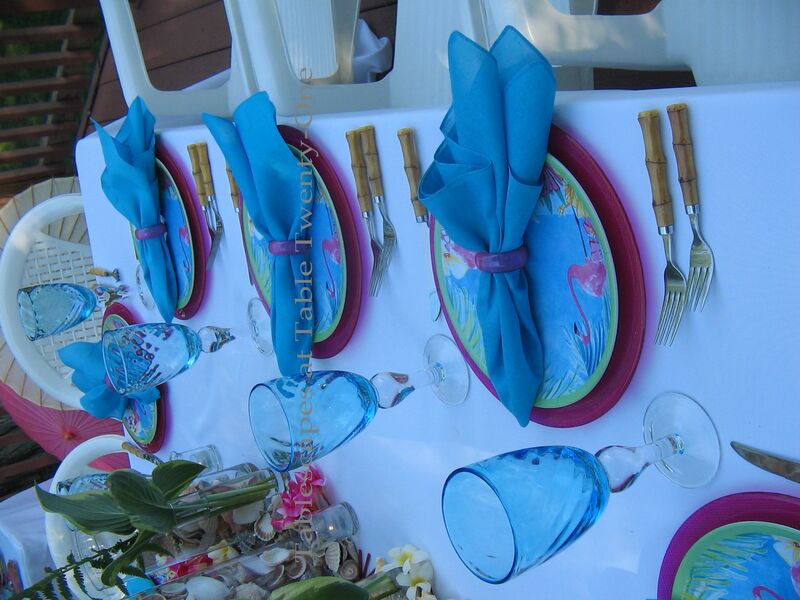 Alycia, Your table is so fun and island inspired! Those flamingos are perfect for a beachy/island table. How nice of Mona to send you those darling flamingo plates! Your colors are so saturated and bright… this is such a happy table! I LOVE the umbrellas! You took the table and continued it on to your deck. How fun!!! I would brave the heat to eat at this table… all I need is that fruity drink with an umbrella and I am ready to limbo! Beautiful! It says summer has begun…..I love pink so this tablescape is wonderful! I love the tropical feeling! It is a great getaway without going anywhere! This makes me want to break out my fake Caribbean accent, have a cute drink with umbrella in it and do the limbo. On second thought cancel the limbo!! Alycia, this is such a fun color combination- turk and pink- those flamingo plates are adorable from Old Time Pottery-great find at that price. Your centerpiece is festive and clever. Love this table! I love your tropical table! The colors are so much fun & it all just screams summer! I love the flamingo plates! The colors you have used are beautiful! I’ve lived in FL for over46 years and love flamingos and tropical decor! Great tablescape, love it! It’s hot hot here but your table is a nice tropical breeze! Love the chargers! My Gordman’s didn’t have them (add me to the run right out of the house list when I heard they might). The flamingos are the perfect touch as is your centerpiece display! Love it all! An amazing summer tablescape with such gorgeous colors! Such fun, happy, charming and inviting tablescape! Goddness my friend, you got TALENTO TO SPARE and a CREATIVE IMAGINATION to no end!!!!! The chargers are fabulous, the glasses are so adorable and the china is gorgeous!! I wish I had you living a couple of blocks from me…BOY, would I have fun!! I can think much of summer things as I live in the Andes where the weather could be one day 65 thru 80, dry and mostly like spring. Daughter Sofia lives by the beach and when we visit sometimes we head to it for some sand and sun. Thanks for your generous and kind visit, you always me so happy and I feel honored by your complements…I mean, you’re a master tablescaper pal!!!!!!!!!! So very cute! Thanks for your sweet comment. Dinner was a success and it was sweet to connect with some neighbors. I’d love to share a meal with my blogging friends. Perfect summer table! I love the white background for the tropical colors. Darling plates. I’ll have to remember about configuring the tables this way. Great idea! such a wonderful table .the colour combination is so beautiful.i love the setting. Graciousness, I so drool and will die for your flamingco dishes. Where did you purchase those? So, different and having them i Sweden? I will be the only “ONE”. Everything is fantastic choosen. Gee… I guess, I don’t have a sense of color which I thought, I have, Lady? But you are always my eye for colors. I been keeping an eye everytime, I log on and wonder what you have for an interesting surprise (at least for moi!). Million thanks for giving me the eye-view of colors, mis or mix-matching and every lil things around your ideas in table settings. I am LOVING it. ENjoy the rest of the week, Lady A and hope everyone enjoy the summer. Gasp,this is so pretty, a tropical paradise indeed!Have never come across flamingo tablewares ever ! Your space here is such a treasure trove of ideas, am your newest follower.Thanks for dropping by mine and really appreciate your lovely comments on my tablescape posts. OOOOOOOOOOOOOOOOOO Alycia, now you’ve done it. First the beautiful peacock table and now my absolutely favorite of all THE FLAMINGO. I LOVE THOSE FLAMINGO CERAMIC PLATES. Would die for those. I found some square flamingo plates this year at Burkes. I’m not stranded in the Midwest like you, but I’m stranded on a mountain top in the middle of a desert in New Mexico. No flamingos, no beach, no tropical. So I’m like you and have to make my own oasis. Don’t know if you know about this site “save-on-crafts.com”. I think you’ll enjoy it. Thanks for sharing all of your many talents with us. I don’t know if anyone else notices how you always sneak a pair of flip flops into your photos when on your deck. I always get a kick out of that.